On March 22, 1909, a group of experienced businessmen who resided in the vicinity of Green Bay and Denmark decided that the prosperous Village of Denmark would be a logical site for a Bank. The group obtained a state charter and opened the temporary offices of the Denmark State Bank with a capitaliztion of $25,000. The first directors chosen were: John Bartelme, H. F. Buckmann, H. A. Dumdey, J. F. Enz, Mitchell Joannes, John O. Jorgensen, Joseph F. Konop, F. W. Kriwanek and W. P. Wagner. Mitchell Joannes was elected president and H. F. Buckmann was elected vice-president. Operations were immediately begun for the erection of more permanent and spacious quarters. The first permanent building was completed and occupied in November, 1909. The second floor housed Bill Rasmussen's clock and clock repair business and the offices of Dr. Gee, DDS, Dr. Broberg, MD and D. H. Thatcher who offered real estate, loans and insurance. During the winter of 1918, the Board of Directors decided that the present building was inadequate to provide for proper service to the evergrowing host of customers and decided to erect new banking quarters. A site was chosen just west of the present facility which was formerly the site of Ed Pelishek's tavern and dance hall, which had burned down in 1916 on the night of the village's first firemen's picnic. The new building was finished early in May, 1919, at a cost of $45,000, and was considered one of the finest financial institutions in the rural districts of the Midwest. The building was open to the public to be used for business meetings and for social gatherings. This facility served its customers and the community for many years until continued growth and changing technologies necessitated the need for a larger and more modern facility. Construction of a new offices just east of the present facility began in the summer of 1973 and was completed in May, 1974. The old building was razed to provide parking for its employees and customers. The Bank is truly a full service bank with products and services to meet the needs of consumers, farmers, and small businesses. 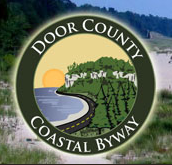 Denmark State Bank is community owned with stock widely held by area residents, with additional offices at Bellevue, Maribel, Reedsville and Whitelaw, serving primarily Brown, Kewaunee, and Manitowoc Counties. The Bank is know for its high quality personal service to customers and its commitment to the communities in which it serves and is proud to be known as the place where customers send their friends. The marker is located at the west side entrance to Denmark State Bank on eastbound Main Street, east of its intersection with Railroad Avenue, at 103 Main Street, Denmark, Wisconsin 54208. The marker is mounted to the facade, to the left of the entrance. 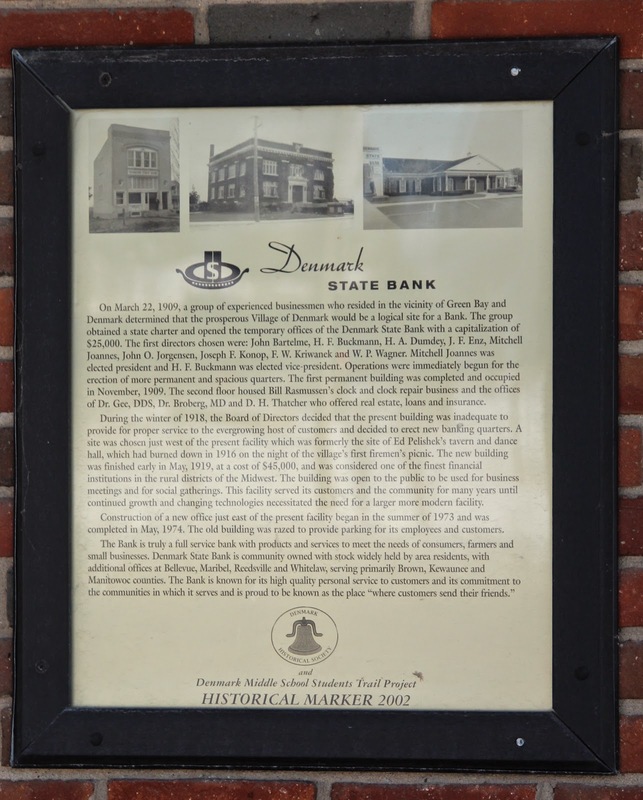 The marker is located at Denmark State Bank.